Vintage StyleIn the mid 1800's, the baseball consisted of a tightly wrapped yarn inner ball that was covered with cowhide. The hide was doubled stitched over the yarn. This vintage ball was always hand made and took about 3 to 4 hours to complete. The trick was to get the cowhide on smoothly, and make the stitches hold on tightly. The double stitching provided a heavy raised effect but it kept the baseball from coming apart at the seams. The cowhide was stitched on in a cross-like pattern (+) not like the current circular stitching. The old balls were not as hard as our current ones and were slightly larger than the current 9 inch ones. The color of the ball was generally a light creamy brown. The same ball was used for a few games and then was refurbished. If the ball was hit into the grandstands it was thrown back onto the field. The ball did not go as far when hit, as the hand rolled yarn was not as tight as ones in use today. Hence this time in baseball history is called the "The Dead Ball" era. Centerfielder Ed Andrews of the National League's Philadelphia Quakers, later nicked named the Phillies. 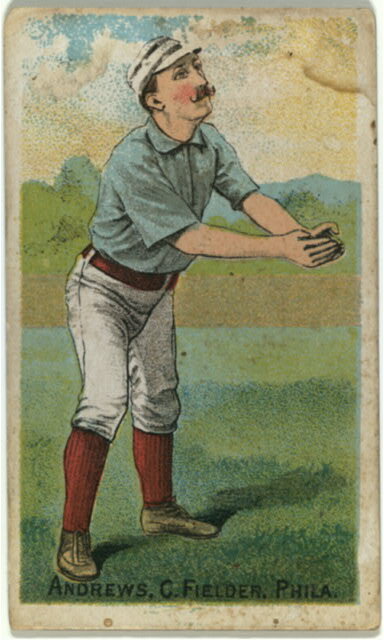 He played at second base during his rookie season, 1894, then was switched to centerfield, 1885-1891. Note: in this late 1880s outfielders and some infielders still played without a glove.